A thorough appreciation of the Siamese we have come to know and love at home and in the show ring of the present decade requires more than an understanding of the history of this fabled breed. It also demands a grasp of the blend of tradition and fact that originally placed this feline with kings in its native Siam. To embrace the full meaning of Siamese does nothing if it does not illuminate the very human desire to set this cat apart. 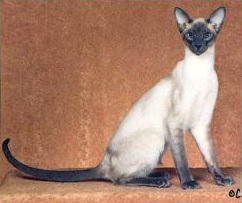 A Siamese is perceived, has been perceived, and will ever be perceived as "special". It is both the abiding grace and frustrating nemesis of the breed. Having conquered the hearts of the mighty British Empire at a time when few four-legged creatures could boast such a thing, the Siamese cat crossed the Atlantic in numbers large enough to suggest that vast area was but a pond. With characteristic charm, the breed vanquished this continent as thoroughly and decisively as it had captured the hearts of Merry Old England. Classes became large; color classes expanded to four: sealpoint, bluepoint, chocolatepoint, and lilacpoint. "Foisted on its own petard!" Alas, everybody was an expert on the Siamese cat, and a little knowledge truly became a dangerous thing. With the familiarity born of enormous popularity, the public viewed the Siamese primarily as a cat with a distinctive color pattern. It is still longingly revered in the same manner, despite stunning refinement in type that brooks no compromise with the Siamese of 30 years ago. To paraphrase Dickens, the decade beginning in 1980 was "the best of times, the worst of times." 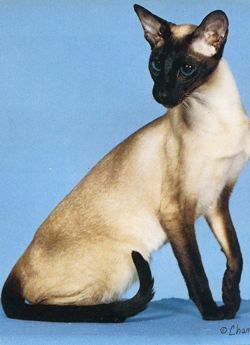 There were three Siamese in CFA's Top 20 in 1980, all lovely cats representing a heritage of the best in Siamese breeding. 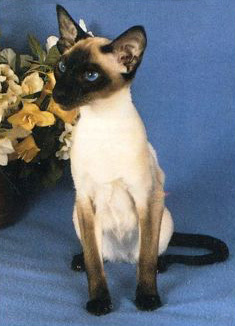 Best Siamese and #8 Cat was GRC Fan-C Love Is Blue, bred and owned by Barbara Baylor. A gorgeous bluepoint with over 60 Best-In-Shows, "Lovy" is fondly remembered by Jeanie McPhee as one of her favorite Siamese. Bernie Landsman bred the #15 Cat and Second Best Siamese, GRC Le-Von Billy Budd, a beautiful sealpoint. Another fine sealpoint was #18, GRC Ophir's Shalimar of Gergrid, bred by Harry and Mary Lou Nolan, and owned by Mac and Ingrid Gerold. As important to the Siamese Fancy as these national wins, was the fact that these cats represented an affirmation of the quality of previous winners. Billy Budd's sire was National GRC Thaibok Teriyaki, D.M., and Love is Blue's sire was GRC Singa Mikado of Fan-C, D.M., also a son of Teriyaki. Shalimar was the daughter of another previous winner, GRC Ophir's Leo. 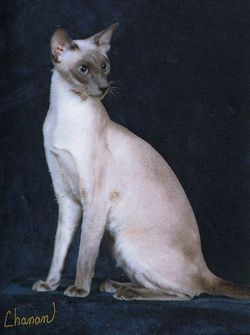 GRC Singa Mikado of Fan-C earned his Distinguished Merit award at age 4, and is the sire of 34 grands to date - 19 Siamese, 13 Oriental Shorthairs, and 2 Colorpoint Shorthairs. Of these, three went on to become National Best of Breed, one of each breed. Two were Top 20 winners. If there is any doubt as to the importance of the Siamese to its offspring breeds, Mikado is living proof. He surely qualifies as a "Man (Siamese) For All Seasons." Best Chocolatepoint Siamese in 1980 was GRC Angkor Rose Devil's Disciple, sired by GRC Quire's Gal-X-C Aldebaran and named for her dam, CH Angkor Rose Devil's Advocate. She was bred and owned by Betty White. The Gerolds had another winner that year, GRC Gergrid's Pia, Best Lilacpoint, sired by CH Risan's Faro of Gergrid. Her dam was CH Tosca of Gergrid. 1981 and 1982 were great years for the cool Siamese colors. 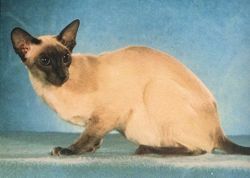 Best Siamese in 1981 was a lilacpoint California Girl, GRC Sea Shell's Sugarfrost, CFA National 15th Best Cat. She was sired by Sea Shell's Sugar Shack; her dam was GRC Venusberg's Elizabeth. Nici Callahan of Sea Shell has been breeding fine Siamese for many years, particularly dilutes, and Sugarfrost was indeed a beauty! 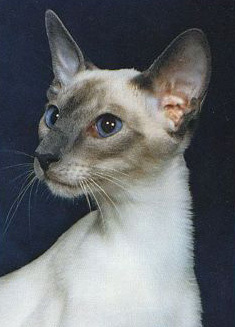 Second Best Siamese in 1981 was also Best Bluepoint and #20 CFA Cat, GRC Windflower's Artemis. Artemis was bred and owned by Carolyn Bullotta. The Best Chocolatepoint was GRC Perelandra's Bittersweet, bred by Valerie Balavage. Both Artemis and Bittersweet were sired by Sharon Kapillian's GRC Shara Smashr, a sealpoint son of an earlier color winner, GRC Shara Solo De Chocolatl. Artemis' dam was Doman's Mia of Windflower; the dam of Bittersweet was Singa Sonate of Perelandra. George Bounds and Sharon McKeehan-Bounds had back-to-back winners in 1981 and 1982. GRC Shabou Suzanne (CH Shabou J.D. x Susan's Sealee Muldoon of Shabou) was Best Sealpoint in 1981, and GRC Shabou Allison Anne-Marie was Second Best of Breed in 1982. Allison Anne-Marie was a daughter of Mikado and Shabou Ashley. 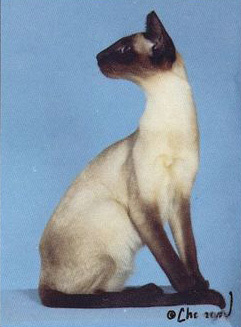 Best Siamese in 1982 and CFA National #17 Cat was Rae A. McCarthy's GRC Karyzam Krystle Dynasty, a bluepoint sired by CH Fan-C Atasi of Karyzam. Her dam was Karyzam Kalyan. Barbara Fraizer owned two CFA National color winners, GRC Calermar's Tarawa of Tamago, Best Sealpoint, and GRC Waltur's Bittersweet of Tamago, Best Chocolatepoint. Tarawa was bred by Carl and Marian Butler; her sire was GRC Calermar's Semper Fidelis and her dam was GRC Calermar's Kelly Girl. Vernon and Nancy Krakow bred Bittersweet, who was sired by CH Jo-San's Akrisios out of GRC Cath-Son's Catherine E. Carolyn Bullotta scored yet again with the Best Lilacpoint, GRC Windflower's Ateles, a brother of her earlier winner, Artemis. "Do you want Colorpoints to be accepted and shown as Siamese?" "Would you like the membership requirements to be more stringent for breed councils?" The results were expected: Siamese breeders answered "No" to the first and "Yes" to the second. "Dainty" was replaced with "refined" in the general description of the Siamese cat. This change, coupled with "medium sized" the previous year, caused the general description of the Siamese cat to mirror that of the Colorpoint Shorthair. In the ballot the following year, "dainty" was replaced with "graceful" in the description of the Siamese body. Is this what Siamese breeders really wanted? It is fair to say, after the fact, that this was a case of being outflanked. Busily defending the fort against an obvious frontal assault, they neglected to be wary of the enemy within. 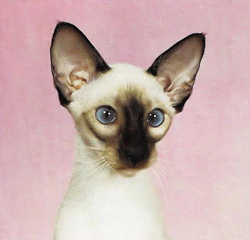 Proponents of expanded Siamese color classes were quick to claim credit for the change to the Standard, a debatable claim since their ranks had been joined by a number of breeders who bred and preferred larger boned cats. Whatever their point of view, Siamese breeders closed ranks behind the movement to strengthen qualifications for breed council membership. Membership requirements were stiffened in February, 1983. 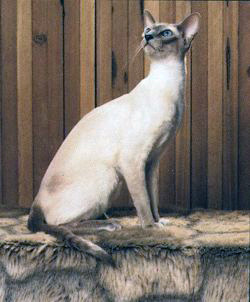 CFA National #8 Cat and Best Siamese in 1983 was a bluepoint, GRC Calermar's Calypso, D.M., bred and owned by Carl B. and Marian Butler. 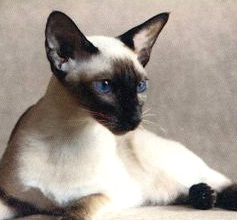 Calypso represented a blend of some of the best Siamese breeding traditions in her part of the country. Sired by GRC Star of Siam Merlin of Calermar who was from Thaibok/Singa/Felitan lines, her dam was CH Star of Siam's Holly of Calermar from some of these same lines plus Lilliput/Maloja. Second Best of Breed was GRC Sanlino Mary Queen of Scots, a sealpoint bred by Bob Molino and Joseph Sanches and owned by Messrs. Molino, Sanches, and Loving. Sired by a sealpoint import credited with many fine offspring both in his own breed as well as Colorpoint Shorthair, CH Alasmar Drusus of Sanlino, Imp. ; Mary's dam was Sanlino's Tortora. Mary was fondly remembered by Barbara St. Georges as one of her favorite Siamese. 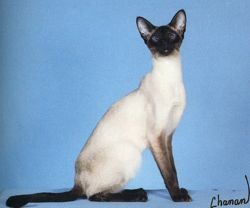 Best Chocolatepoint Siamese in 1983 was Claire and Elizabeth Vanier's CH Ra-Bast Seashell. GRC Lilliput Tanqueray, bred and owned by Harriett Little, was Best Lilacpoint. Tanqueray was sired by CH Waltur's Bacchus of Lilliput and his dam was GRC Quin-Jo's Tanelle of Lilliput. If Siamese breeders could be characterized as complacent and/or secure in their position with the CFA scheme of things prior to the 80's, this was surely no longer a part of anyone's thinking after 1984. The conservative, glacier-like giant that had been the CFA Board of Directors prior to the 80's moved with a swiftness that dazzled in initiating a number of changes that got Siamese breeders' attention. If the Himalayan could be considered a pointed Persian, if the Abyssinian could now come in blue despite the wishes of the Aby Breed Council, then what about ...? The UNTHINKABLE found fertile ground in minds heretofore otherwise occupied. Another sleeping giant opened its eyes, this time a creation of unified Siamese breeders intent on preserving the Siamese cat as a feline of the Himalayan coat pattern in chocolate, seal, lilac and blue - period! The fact of the matter was, and remains, that much of the rest of the Siamese Fancy around the world does not hold our view of this most ancient breed. Cognizant of the fact that CFA is not the only game in town, would the CFA Board move to align the Siamese breed with its counterparts elsewhere? What could CFA Siamese breeders do about this? (Are we still holding our collective breath?) More of this fascinating question later. Meanwhile, back in the show ring, GRC Sapad Mme. 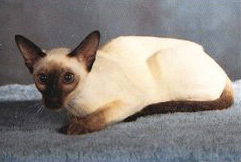 Charlotte H. became CFA's 10th Best Kitten in 1984, Best Siamese, and only barely missed the Top 20 cats. Bred by Pam DelaBar and Pat Steinlicht, bluepoint Charlotte was sired by Calypso's brother, GRC Calermar's Semper Fidelis. Her dam was GRC Sapad's Hot Cross Buns. Second Best Siamese was GRC Caru Tao Baka, bred and owned by Dayle Russell. Baka even took time from her busy schedule to raise a litter of kittens! A sealpoint, she was sired by GRC San-Li's Chao Fa of Cannoncats and her dam was CH Stonewood Kishe Ah Kum of Caru. Best Chocolatepoint was GRC Cherlou's Dream Queen of Thai-Mar, bred by Cheryl M. Gleissner and owned by Nancy Brower. Her sire was CH Thai-Mar Talisyn; dam was Sianova's Kahlua of Cherlou. Best Lilacpoint, bred by Debbi Stevenson, was GRC Shimasu's Lavendar Lace Rosepetal, owned by Debbi Stevenson and Pat Koenig. This lovely girl was an offspring of GRC Shimasu's Asriel and Kaitu Amanda of Shimasu. Having failed to break in the Top 20 in 1984, as we have seen, Siamese breeders had to be satisfied yet again in 1985 with a Siamese in the top kittens. CFA National #5 Kitten was GRC Calermar's Esprit d'Corps. Sired by CH Sanpet's Amazing Abraham of Shabou, "Cory's" dam was GRC Calermar's Calypso, D.M. A bluepoint, Cory was bred and owned by the Butlers. Another narrow miss in 1985 for yet another bluepoint! She may have lost a Top 20 spot, but GRC San-Toi's Celebration In Blue held tight to her title of Best Siamese. Sired by GRC Waltur's Koi-Boi, Celebration's dam was CH San-Toi's Blue Horizon, D.M. She was bred and owned by Deanne Johnson and Connie Roberts. Second Best of Breed was a sealpoint, GRC Thai-Mar Jicky of Ninja, bred by Nancy Brower and owned by Susan Knight. (Thai-Mar Sealute of Estuary x GRC Thai-Mar Magique Noire). Best Chocolatepoint Siamese was GRC Angkor Rose Choctaw, sired by GRC Angkor Rose Chip O'Honey. His dam was GRC Angkor Rose Shrinkin' Violet. Choctaw was bred and owned by Betty White. Best Lilacpoint was GRC Nefrtt's Pharoah, bred and owned by Deborah D. Misotti. Sired by CH San-Toi Osiris of Nefrtt, Pharoah's dam was CH Calermar's Independence of Nefrtt. Siamese breeders take a dim view of Finals and National Awards devoid of their favorite breed. 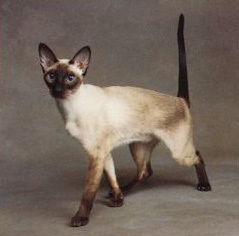 Grumbling was replaced during the mid-80's with action in the form of breed clubs organized to promote the Siamese and return it to prominence in the show ring. Breeders met in Wichita, Kansas in July of 1984 and formed Gulf Shore Siamese Fanciers, a regional breed club that now boasts members all over the United States and Canada. The Gulf Shore Siamese Fanciers Quarterly is published in January, April, July, and October, and the organization is sponsoring annual shows with Siamese Specialty rings. Joining this group are two other new Siamese breed clubs, Mid-America Siamese Club and North Pacific Siamese Fanciers, both of whom are planning shows as this is being written. The three older breed clubs continue to thrive. Northwestern Siamese Fanciers is still active; National Siamese Cat Club held an allbreed show this season and still publishes The National Siamese Cat Club Newsletter. This Eastern-based organization with national/international membership is joined by equally prestigious Siamese Fanciers on the West Coast to bracket the continent. Siamese Fanciers, publishers of Thai Line, host the only all-Siamese show in the country, unique among breed shows anywhere. HEAD, Insert the words "an approximate equilateral" before "triangle" in the third sentence. For the first time since 1979, Best Siamese in 1986 went to that supposedly most classic color of Siamese, sealpoint, GRC Nefrtt's Amulet. Bred and owned by Deborah D. Misotti, "Amy's" sire was CH San-Toi Osiris of Nefrtt and her dam was CH Calermar's Independence of Nefrtt, the same breeding that produced Pharaoh. Second Best of Breed was a bluepoint male, GRC Luin's Elendil, bred and owned by Lee Genet. (CH Sea Shell's Sugar Shine of Luin x GRC Luin's Mithril). GRC Angkor Rose Chip O'Honey, sire of the 1985 Best Chocolate, also did it again in 1986. This time the winner was GRC Angkor Rose Jarah of Sandancer, bred by Betty White and owned by Paige and Bill Via. Her dam was CH Angkor Rose Pipe Dream, daughter of a previous winner, GRC Angkor Rose Dixie Daydream. Nici Callahan was out with another lovely winning lilacpoint, GRC Sea Shell's Sweet Dance, sired by earlier winner GRC Vindabona Lance of Sea Shell. Sweet Dance's dam was Sea Shell's Ski-Yoko. 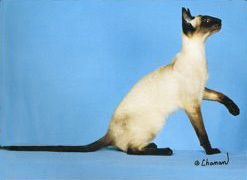 1987 witnessed a return to the Top 20 for the Siamese breed, and it was almost home for two! GRC San-Toi's Christa M was CFA National #16 Cat and Best Siamese. GRC Elsk Back In Business was Second Best Siamese, and just missed making the Big Time. Two stunning sealpoint girls, both from the Pacific Northwest, traveled far and wide chasing that brass ring. Bred and owned by Deanne Johnson and Connie Roberts, Christa was sired by yet another Singa Distinguished Merit male, CH Singa Ballad of San-Toi, D.M. There was a familiar ring to her dam's name, Dahin Daneta of San-Toi. Lynda Campbell bred and owned Business, who was sired by GRC Perelandra's Heart-Throb out of Elsk Panthera. Best Bluepoint Siamese was Debbi Stevenson's GRC Shimasu Reisha. Reisha, with an impressive show record, was sired by CH Nefrtt Puttin' On The Ritz. Her dam was GRC Shimasu's Rebecca Sue. Best Chocolatepoint was GRC Lorrell's Almond Joy of K-M'Ling, bred by Lois Orrell and owned by Carol Keller. Joy's sire was CH Singa Maestoso; her dam was GRC Calermar's Misty Blu of Lorrell. Marcia Mulcahy on the West Coast boasted the Best Lilacpoint in CFA, GRC Pridenjoy Cameo. Sired by CH San-Toi's ET, Cameo's dam was CH Nefrtt's Olivia of San-Toi. All of which brings us to 1988. "And the winnahs are ….!" Best Siamese goes to a younger sister of Business, GRC Elsk Vikivet, a beautiful lilacpoint bred and owned by Lynda Campbell. Second Best of Breed and Best Sealpoint is GRC Sion's Tawny, bred and owned by Dale and Lynn Steinfeld. Tawny, from her breeders' first litter, was sired by CH Sianova's Mr. Spock and her dam is CH Sianova's Cindy of Sion. Best Bluepoint Siamese this year is GRC Pridenjoy's Kelsey. Marcia Mulcahy's lovely bluepoint was sired by Sotar's Sugar Daddy. Her dam is GRC Sotar's Kimberly of Pridenjoy. Best Chocolatepoint Siamese is GRC Angkor Rose Shantung of Offshore, owned by Diane Dagley. Bred by Betty White, Shantung's sire is GRC Ankgor Rose Pied Piper and her dam is GRC Angkor Rose Kristyne, D.M. While the history of a breed is certainly not written by its altered cats, it is also true that recent years have witnessed a growing number of winning cats in Premiership bred by established breeders of all breeds of cats. The Siamese is no exception. GRP Elsk Bar James Net, bred and owned by Lynda Campbell was a National winner in 1981. GRP Lampang Chi of Katzojazz; bred by Pam Christensen and owned by Eleanor M. Mills was a 1983 winner. In 1984, Carol Keller's GRP K-M'Ling Cameron was Third Best Cat in Premiership. 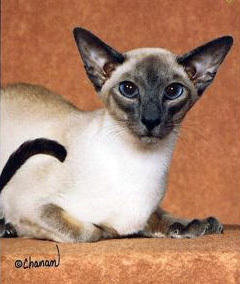 The next year, 1985, saw three Siamese in the Premiership Top Ten; GRP Waltur's Bat Boi, bred and owned by Vernon and Nancy Krakow, GRP Klinekatz Delft Libra of Salzpalz, bred by Sandra Kline and owned by Sally J. Devriend, and Claire and Elisabeth Vanier's GRP Ra-Bast Fledermaus Junior. Save for a single show season, the decade of the 80's is nearly over. Asked to consider the decade, Jeanie McPhee commented that coats are better now and great strides have been made in refining bone. Kim Everett thinks this decade has been one where breeders came to their sense, bred better bodies, and selected for a prettier cat. Classes are more uniform in quality and the dilute colors are more able to compete. She thinks color and temperament are improved, though eye color is a mixed bag. Kim made one statement that Siamese breeders will especially appreciate, "Judges consider Siamese and Persians foundation cats and we expect the most from them." In remembering some of her favorites, MaKhanDa Willa, Sia-Mews Dixie Dream, Jen-Kins Dark Hussy, Kalyan Kavalier of Krebs, Santana's Pdgorny and Tuter's Black Bart, she observed that judges saw these cats and wanted more of the same. "The daintiness about them was beautiful," she said, "making the extremes seem coarse, grotesque." Jeanne Singer states unequivocally that our Siamese today are as beautiful as ever, that the reason our cats do not get the recognition that they once did is due to all the newer shorthair breeds. She does think, however, that it was a big mistake to take "dainty" out of the Standard! Certainly many judges have been heard to remark of late that it is great to see the Siamese "coming back." For those of us who have been here all along these many years, it is tempting to ask where they think we have been! The obvious answer to this puzzle, however, is that Siamese classes have been getting larger recently. Siamese breeders hope that it is the result of their own efforts to focus on the breed. Surely the breed clubs have worked diligently to promote and protect the Siamese cat, and the Siamese Breed Council Breakfast held each year at the CFA Annual affords a further opportunity to meld the Siamese community into a cohesive whole through fellowship and thought-provoking programs. It is a good deal easier to assess anything with the perspective of time, but lacking that, one must look for recurring themes in recent history. It seems to this writer that the last ten years in the continuing story of the Siamese cat have to be viewed in the context of the explosion in numbers of shorthair breeds. The move to expand color classes might be termed a variation on this same theme, were it not for the fact that this movement's primary premise was the denial of anything essentially "new." Having been the world's favorite shorthair domestic cat for as long as memory serves, the Siamese had to move over for its offspring breeds as well as other newer shorthair breeds. Cat fanciers found themselves with a veritable smorgasbord of breeds from which to choose. This growing selection had to be welcomed by those weary of attempting to survive huge Siamese color classes. When the newer breeds found Final slots, inevitably at the expense of the Siamese, those huge Siamese classes began to thin. With the thinning came an overall increase in quality. There is a more uniform level of excellence among those remaining. Perhaps those Siamese breeders who refused to be discouraged, who continue to work, to improve, to show their cats, exhibited the only true love for the breed. (As the saying goes, When the going gets tough, the tough get going!) While Jeanne Singer observed that the Siamese has been "discouraged to death," it seems that this is surely the flip side of its being nearly loved to death 30 years ago! A hardy group of breeders were forged in the trials of the 80's, a significant number of which could still remember another day, another time. And more of these breeders should be mentioned than just those whose cats attained National Best/Second Best of Breed, Best-of-Color, or a Premiership win. Cattery prefixes found on three or more Grand Champion Siamese over the last decade are: Bel Canto, Blu Luv, Cannoncats, Cerissa, Chez-Chat, Clowntown, Floratea, Galari, In Lieu, Innisfree, Kamju, Lebianco, Misirlu, Petipa, Petitfois, Printer, Rotchana, Quire's Gal-X-C, Sarasam, Shera Len, Sianova, Skipsu, Suomi, Susan, Su-Su, Swanroad, Tamago, Tan-Tara, Terlin, Teshari, Tomsimons, Twosisters, Vavhra Kay, and Venusburg. Spanning the decades to breed 3 or more Grands are Dahin, DeVegas, Fabuline, Jecaro, Jorene, Longbrook, Tayohme, The Globe, Snow Ridge, Valhalla Lake, Vindabona, and Wa-la. What do we see in our crystal ball? Kim Everett hopes Siamese breeders don't change direction, for the Siamese today are so well balanced. Jeanie McPhee urges us to safeguard the health of our cats above all else. Larry Adkison urges breeders to show their cats in increasing numbers. All this advice will be taken to heart. But what will time likely do to the Siamese in terms of how it looks and how it is shown? The Siamese purports to be one of the oldest breeds to live with man. Lacking historical verification in the form of solid documentation, one must ask the cats themselves what they know of this. The answer is loud and clear, given in the characteristic voice like no other, developed over centuries in an attempt to communicate. Is this not evidence of an ancient domesticity? The Siamese cat, as any veterinarian will tell you, recovers best at home with his people. Is this not evidence of an ancient breed? The Siamese female chooses your bed in which to have her kittens, no dark secluded place for her! Is this not evidence of an ancient domesticity? Do what you will, write, as I am doing now, comb your hair, read the paper, you are not doing it alone, unaided. Is this not ...? Time will but perpetuate and accentuate the Siamese personality. While we breeders will refine, attempt to perfect - ever chasing the ideal - it is highly unlikely that we will see the remarkable strides in type witnessed over the past 30 years. There is not a good deal more to do that is dramatic. But all this prognostication falls by the way if the Siamese gene pool is enlarged to include other colors now found in a separate breed. There does not seem to be any real sentiment among CFA's "movers and shakers" to do this. I like to think this has a good deal to do with the sheer value of the present Siamese gene pool to other breeds, along with a hesitation to significantly alter or risk losing altogether, one of the world's most ancient honored breeds. Evidence pouring in from around the world, where a different path was chosen, suggests the ultimate wisdom of the world's largest cat registry in preserving this cat for all - The Siamese, if you please - in chocolate, seal, lilac, and blue.